What's new with Japanese temari? Click here for updates. Temari てまり ("hand ball" in Japanese) is a folk craft born in ancient Japan from the desire to amuse and entertain children with an embroidered toy thread ball. 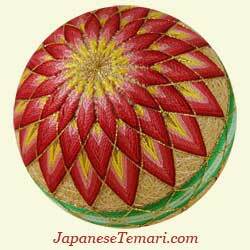 The art of temari began as a simple needlework to make a mari ball for play. Today, the lovely thread-wrapped, Japanese embroidered temari balls are given as tokens of good luck. 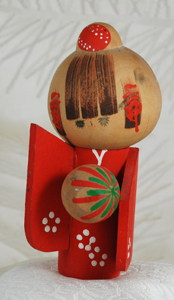 A stitched temari ball on a stand is displayed and enjoyed as a striking example of this style of Japanese thread ornament. It's an Oriental folk art which is spreading all over the world! Temari has a long and symbolic history. As Buddhist missionaries traveled east from India through China and Korea to Japan, they spread not only religious beliefs but culture. The Japanese craft of stitching temari balls is said to have its origins from kemari (football) brought to Japan from China about 1400 years ago. The art of temari comes from simple beginnings. Making Japanese temari balls grew as a needlework handcraft for noble women in the early part of the Edo Period (1600-1868). Maids of the court stitched colorful thread globes for young Japanese girls. They would sit on the floor with the children rolling a temari ball between them. Tossing and bouncing games followed. Over the years, region by region, more Japanese women became interested in Japanese crafts, and they explored this folk art as an Oriental needlecraft and improved it. They added noisemakers to the inside to delight the ear. They added stitching designs from Japanese crafts as well as other Asian embroidery designs, like the kiku (chrysanthemum) and they copied the colors of nature around them. Kaleidoscope designs became favorites for Japanese temari balls. They used the brilliant colors of kimono silk, stitching eye-catching temari patterns. Sometimes, temari are called silk ball ornaments. Ever changing, becoming more and more complex, each of the new temari balls was a delight to behold, an embroidered puzzle. Bits of yarn and thread from other projects are used to create your own Japanese temari balls to give as gifts on special occasions or to decorate your home. Japanese temari is a craft of recycling and you'll find the few supplies that you need to purchase are very inexpensive. The low start-up cost makes temari one of the easiest Japanese crafts to begin and a great place for children to express their creativity. You'll need a darner needle, a bit of soft yarn, some thread for wrapping the Japanese temari and craft thread or pearl cotton embroidery thread for stitching the design. Like in quilting, creating geometric and floral designs in fiber and exploring their relationships through color is an intriguing hobby and a never-ending challenge. Perhaps you will make some of your own easy temari Asian Christmas ornaments by using the free temari techniques instructions offered on this site. Temari can be a styrofoam ball craft or you can make your own base from scratch. 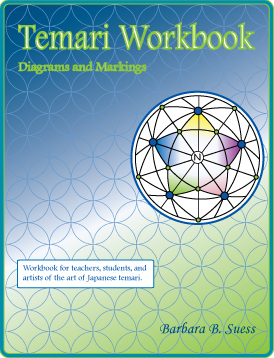 Look for the book which includes directions for making and embroidering temari with the kiku design (using a kiku herringbone stitch), trefoil, spindle stitch, squares, triangles, and many combinations of these stitches, like the Star of David. And create a meaningful gift. As you stitch, let your spirit and creativity flow into your temari so you give it along with your artful creation. What a precious blessing to give to someone you love! Caution: Stitching temari can be highly addictive!